So you have frozen chicken breasts in the freezer and need to make dinner? 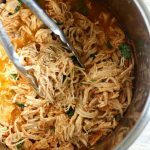 Throw them in the slow cooker with some salsa, lime juice and some seasonings and you’ll get perfectly shreddable chicken that you can serve in burritos, enchiladas, tacos, salads or quesadillas. Dinner can’t get easier than this! Add all ingredients except for cilantro into the slow cooker. Cover and cook on low for 6-8 hours, or until chicken is tender. Remove chicken and place on a cutting board. Shred the chicken and then return it back into the crock. Stir chicken in with the juices. Add in the cilantro. Serve and enjoy! *If your chicken is not frozen just cook it for 4-6 hours instead of 6-8 hours.